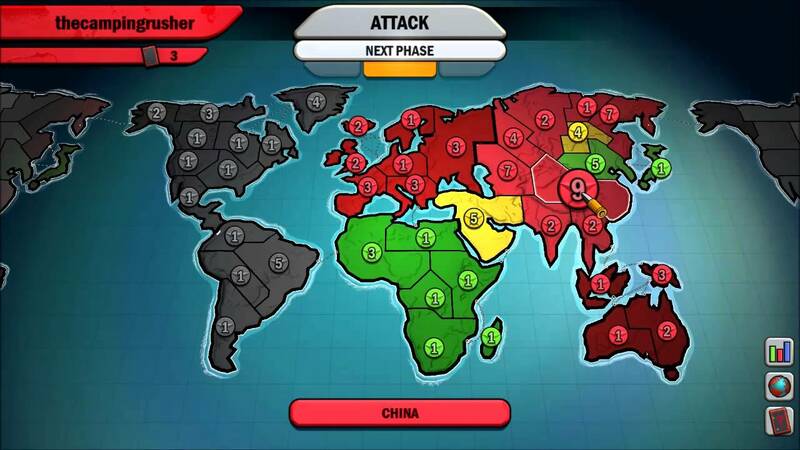 While Risk will always be a great strategy board game, it has since transcended its original form and has moved to the digital side of things. The great thing about having Risk in video game format is its accessibility and convenience, among many other things. But while the Risk video game is a convenient way to take the board game from the tabletop to the digital realm, it’s not the best in the bunch. 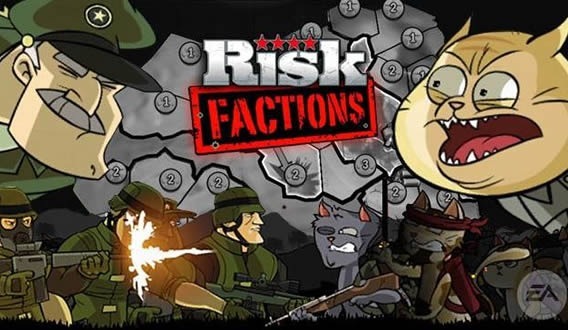 There is also Risk: Factions, a Risk video game that is available for multiple platforms and is more feature-packed than its predecessor. 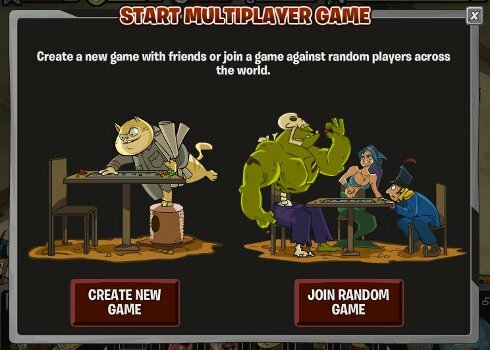 For those who want to play Risk multiplayer online, the original Risk video game can’t do that since it only has hot-seat multiplayer included. For that, you’ll want to get Risk: Factions, which was released back in 2010 for PlayStation and 2011 for PC by Electronic Arts and developed by Stainless Games. It was received positively by video game critics and pundits, and community reviews are pretty good as well. But of course, it has to pass the scrutiny of board game players as well, and it does well enough for itself. The most obvious one is that Risk: Factions has an actual online multiplayer mode that lets you play with other players from all around the world. Since it’s a turn-based strategy game, there is a lot less to worry about when it comes to lag and latency; all players need is a stable enough connection. The board isn’t a map of Earth, but of fictional continents that you must conquer. There are also environmental hazards like volcanoes and such that can threaten to take out your armies if you’re not careful enough. As for the single player, this game has more than just AI battles, but also a campaign to sink your teeth into. It’s a bit on the short side, but it provides a good amount of lore and flavor behind each of the factions that lend the game its subtitle. Being the selling point of this game, the factions add tons of personality to what are usually faceless pieces on the map that only differ in color and type. Other than the different looks, they still play mostly like how the pieces work in the board game. Along with the factions, this game has a cartoon-style look that sets it apart from the usually dry presentation on classic Risk that is all serious historic military stuff on it. There’s also orchestral music in the background and voice acting from different characters to give it even more style points. There are objective-based rules added in to mix things up, so this game is more than just about grabbing as much land as you can. Those objectives add more variation and strategic possibilities, making players have to switch between priorities depending on the situation on the board. There are more than three objectives in each game, so the key is to choose which one you should go after so that you don’t spread yourself too thin while having to take territory and defend against enemy forces while you fulfill that objective all at the same time. 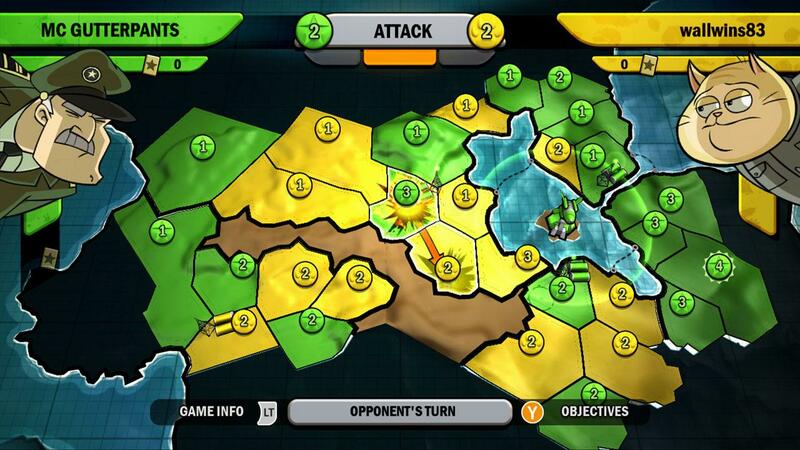 Other than all of that, it does play much like classic Risk, so veterans won’t find it too difficult to get into. It’s still the dice-driven game that gives credence to the Risk name. The first thing to get into is what this game is named after — the 4 factions that vie for dominance on the map. They are the Humans, Cats, Robots, Zombies, and the Yeti. Each is represented by a leader whose traits greatly reflect their characteristics as a whole. For the Humans, they have General Willian P. “Fatty” McGutterpants, who is a Patton-MacArthur hybrid who is never present without both his jingoist attitude and his pet dog. For the Cats, there’s the communist Generalissimo Meow who is out for revenge after they were attacked by a mortar dropped by McGutterpants’ dog. For the Robots, it’s this world’s version of Skynet and HAL 9000 combined as Commandant SixFour, who can’t distinguish friend from foe due to its obsolete graphics technology. For the Zombies, its’ Colonel Claus Von Stauffenberg, known to most as Stiffy and is a product of an experimental bioweapon courtesy of Commandant SixFour. Finally, for the Yeti, it’s abominable but wise head monk His Excellency Gary, who ironically declared war against all other factions after McGutterpants asked for his help to bring peace among them. Most of the time when a classic board game gets messed with and has more bells and whistles added to it, the gameplay becomes clunky and frustrating. This is mostly true with attrition-based strategy games like Risk, but the designers of Risk: Factions has done a pretty good job in streamlining the gameplay while adding more personality to it.